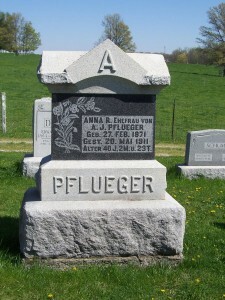 Anna R. Pflueger, Zion Lutheran Cemetery, Schumm, Van Wert County, Ohio. Alter 40 J. 2 M. u. 23 T.
Translation: Anna. R. Wife of A.J. Pflueger, born 27 Feb. 1871, Died 20 May 1911, aged 40 years, 2 months and 23 days. Anna was the daughter of John C. Pifer and Fredrika Kniesel. Anna was born in Ohio and both her parents were born in Germany. Anna married Adam J. Pflueger about 1893. Adam was featured in last week’s Tombstone Tuesday. According to the records of Zion Schumm, Anna Regina Pflueger, born Pfeiffer, was born 27 February 1871 in Auglaize County, Ohio. She died on 20 May 1911 at the age of 40 years, 2 months and 23 days. She was buried 23 May 1911 in the parish cemetery. Survivors included her husband Adam Pflueger; 5 children, Otto, Frida, Georg, Della and Viola; 5 full brothers, 2 half brothers, a stepfather, 3 stepsisters and 2 aunts. 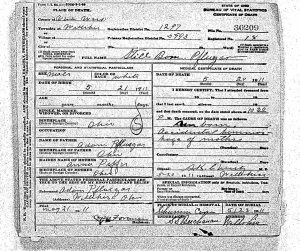 Death Certificate of Ann R. “Pfluegar”, Van Wert Co., Ohio, 20 May 1911. Anna died on 20 May 1911 at 10:30 p.m. The writing on her death certificate is difficult to read but it appears that her cause of death was splenomegaly [enlargement of spleen], of indefinite duration, with accidental trauma from a detached placenta contributing to her death. Stillborn infant male “Pfluegar”, Van Wert Co., Ohio, 20 May 1911. 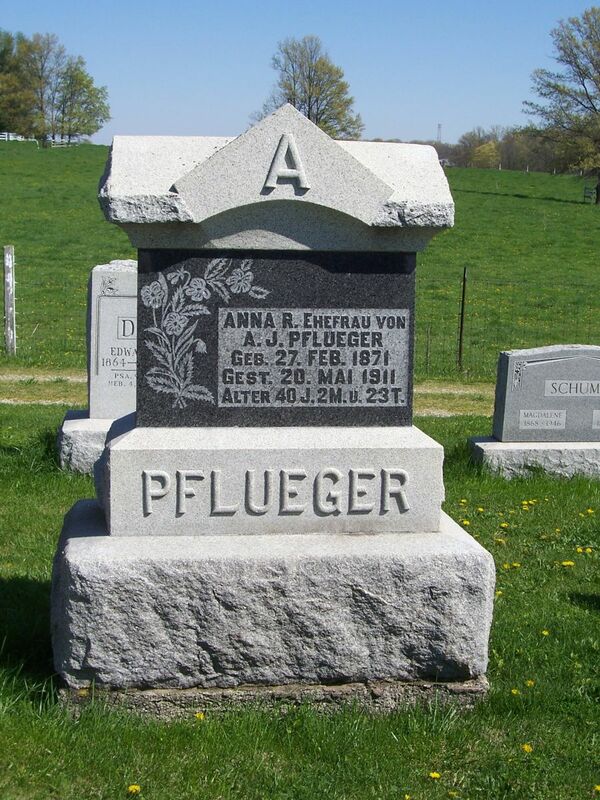 The above death certificate is for a male “Pfluegar”, the stillborn child of Adam and Anna (Pifer) Pfluegar, who died on 20 May 1911 at 10:30 p.m., the same day and same time that his mother Anna died. The cause of his death was given as accidental hemorrhage of mother. His birth date is recorded as 21 May 1911 and his death date recorded as 20 May 1911. That seems a little strange. The birth date may have been recorded incorrectly or perhaps they had to remove the baby the next day. I do not know very much about a detached placenta condition and will probably never know the whole story. The death certificates also state that mother and infant were buried in Schumm Cemetery on 23 May 1911. The church records do not mention the infant’s death or burial nor can his tombstone be found. Perhaps he is buried with his mother. I was not expecting to learn of this sad story and would not have if I had not searched for the death certificates of family members. 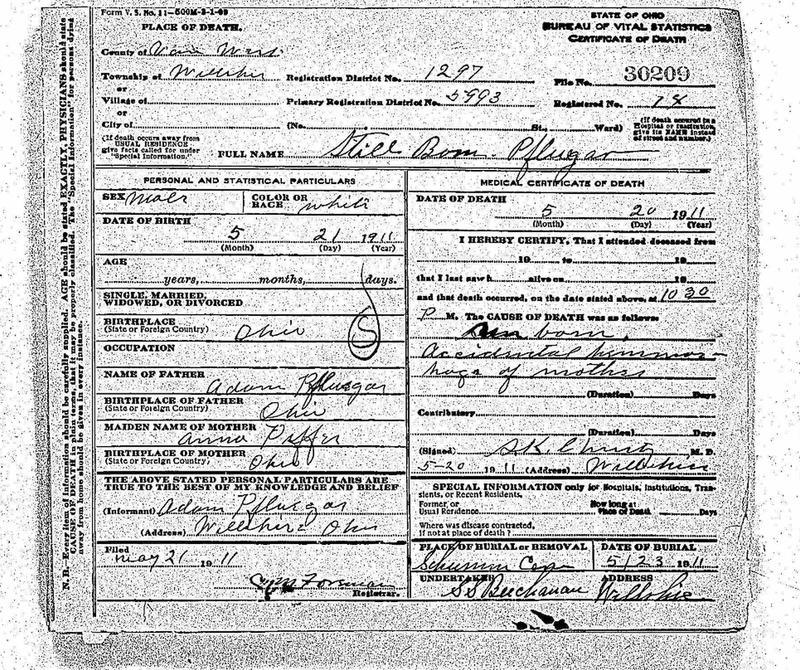 Family Search.org has Ohio Deaths, 1908-1953, which consists of images of Ohio death records from the Ohio Department of Health. It can be worthwhile to check those additional sources. 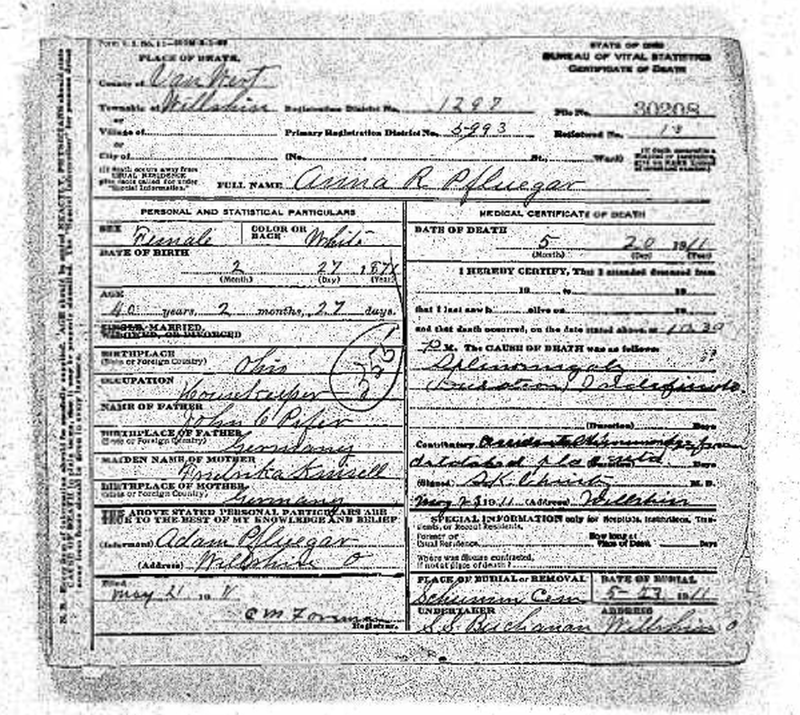 “Ohio, Deaths, 1908-1953,” index and images, FamilySearch (https://familysearch.org/pal:/MM9.1.1/X8DH-7MK : accessed 03 Feb 2013), Anna R. Pfluegar, 20 May 1911; citing Willshire Twp., Van Wert, Ohio, reference fn 30208; FHL microfilm 1952987. “United States Census, 1900,” index and images, FamilySearch (https://familysearch.org/pal:/MM9.1.1/MMXJ-8ML : accessed 27 Jan 2013), Adam Pflueger, ED 97 Willshire Township Willshire village, Van Wert, Ohio, United States; citing sheet 9B, family 199, dwelling 185, NARA microfilm publication T623, FHL microfilm 1241329. 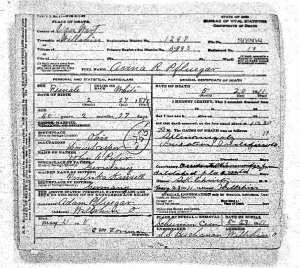 “Ohio, Deaths, 1908-1953,” index and images, FamilySearch (https://familysearch.org/pal:/MM9.1.1/X8DH-7MP : accessed 03 Feb 2013), Pfluegar, 20 May 1911; citing Willshire Twp., Van Wert, Ohio, reference fn 30209; FHL microfilm 1952987. It is so uplifting to see the beautiful green grass, even the bright yellow dandolions, in your grave marker photographs. While the snow and ice cover the land, you have certainly planned and prepared well in advance for your weekly presentation of historical, family snapshots, planning even apparent in the delay from the photography and actual article publication. While it is difficult to assess size, etc. from a simple photograph, this tombstone (as well as that of her husband last week) appears to be very large, high quality granite (or marble) stones. At a time when most graves were marked with simple, small limestone markers, many of which have not held up well with the years, what does such a fine monument say about the person(s) buried in this grave? Indeed the cemeteries in Chatt and Schumm Lutheran church graveyards contain almost none of the small, worn limestone markers, which would appear to contrast markedly with most early cemeteries that i have visited. While such stones certainly must be available in the area (either local material or shipped), the real crux of the issue would appear to be cost. Where these wealthy congregations (individuals) for their time? Both of their tombstones are very similar and both are in very good condition. They are nice granite markers. I do not know how wealthy the family was. I assume they were about average for the area. He was a farmer and I believe he owned his farm. In the early 1900s Sears sold tombstones from their catalog. A tombstone from the 1908 Sears Catalog that looks similar to their stones sold from $110.67-$241.88. Another similar stone sold from $72-$134. A fair amount of money for that time, but probably not out of reason. 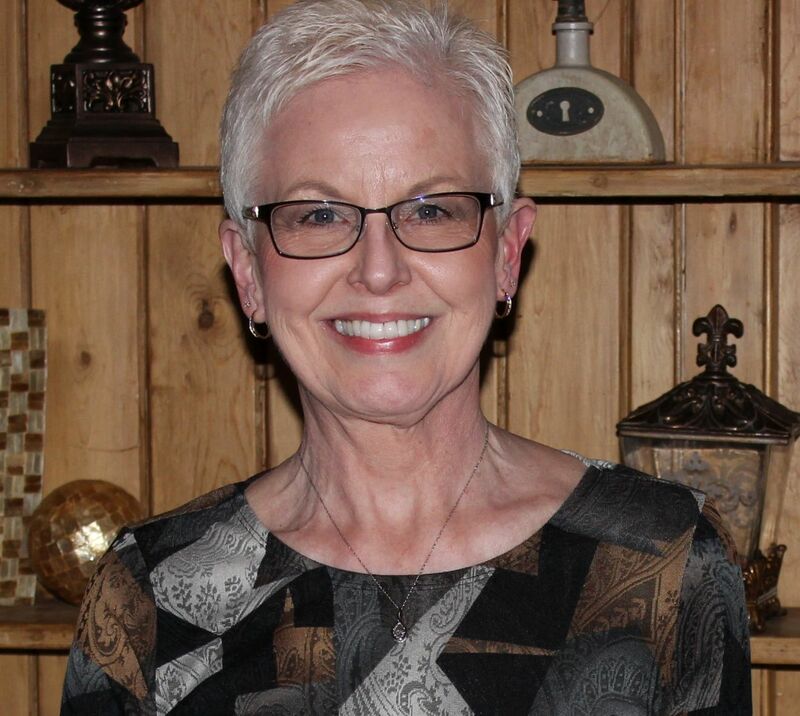 Karen thank you so much for the time and effort you put into the history of these early Ohio residents. Adam and Anna Pflueger are my Grandmother Della Krugh’s parents. You are welcome! I am happy you find the information interesting and informative. Plus, we are related! Thanks for writing.